Another jewel has been added to Eden’s increasingly sparkling crown with the NSW Government providing an additional $9 million in funding to construct a wave attenuator in Snug Cove. The extra funds come on top of $10 million announced in 2014 for the Eden Safe Harbour Project and will allow for the government’s preferred option to be constructed, a total cost of $19 million. “In November 2017, we called for expressions of interest for both floating and fixed panel wave attenuator options,” Member for Bega, Andrew Constance says. “The Government carefully reviewed applications and decided that a fixed panel wave attenuator will provide the best wave climate and the safest possible harbour for local and visiting vessels. “Eden port can be exposed to significant wind and wave conditions which can affect maritime safety and increase the risk of damage to vessels moored in Snug Cove. “The wave attenuator will calm wave activity in the cove providing a safe harbour for local and visiting vessels as well as improve the protection of existing maritime infrastructure,” Mr Constance says. Rob Bain, Secretary of POEM (Right) with Andrew Constance, Member for Bega, and residents of Eden. Photo: Supplied. The issue has been that Snug Cove is seen as an unsafe port for small vessels because of its exposure to south-westerly gales. The local group who has been advocating for the attenuator since 2010 says vessels are damaged in the port every year, limiting the potential of Snug Cove being a major small boat hub and in turn onshore economic development. “This is fantastic news,” says Secretary of Port of Eden Marina (POEM), Dr Rob Bain. “A safe harbour in Snug Cove will provide a huge boost for the key economic drivers of tourism and boating in South East NSW. These have a major impact on jobs, investment and the overall prosperity in the region. “The attenuator announcement paves the way for the development of a 170 berth commercial marina. “The overall marine and harbour precinct development plans for Snug Cove are magnificent. A first-rate cruise ship terminal, a large marina, and a vibrant tourism hub, whilst still maintaining the traditional commercial fishing, charter and whale watching which have attracted so many tourists in the past,” Mr Bain says. Eden is a busy place at the moment, the town’s famous fishing vessels are currently sharing their space with heavy machinery as the Eden Breakwater Wharf Extension grinds on. The $44 million project is jointly funded by the Australian Government, NSW Government, and Bega Valley Shire Council. Around 80% of the wharf piles have so far been driven into the seabed of Snug Cove to create the foundations for the new wharf extension. In addition, Waterways Construction have completed 60% of the onshore bollard piles, work is also underway on the piling works for the mooring and berthing dolphins. The wharf extension is due to be completed in mid-2019 at which point the ever increasing number of passenger cruise ships visiting Eden will be able to pull up alongside rather than drop anchor in Twofold Bay and rely on tenders to get those ‘wallets’ ashore. The NSW Government has also announced $4 million for a cruise ship passenger welcome centre. An artists impression of the Eden Breakwater Wharf Extension. Photo: NSW Dept of Industry. It’s anticipated that construction of the fixed panel wave attenuator will start in early 2019 and run for 12 months. The NSW Department of Industry has been working with Waterway Constructions in finalising the design and construction contract. 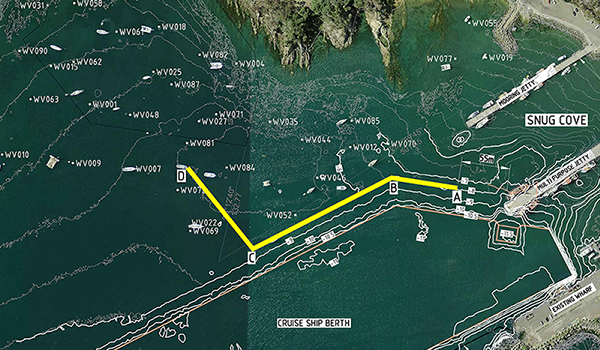 When complete the wave attenuator will be 366 metres in length, starting its run 55 metres from the end of the multipurpose jetty and extending into Snug Cove towards Cattle Bay. 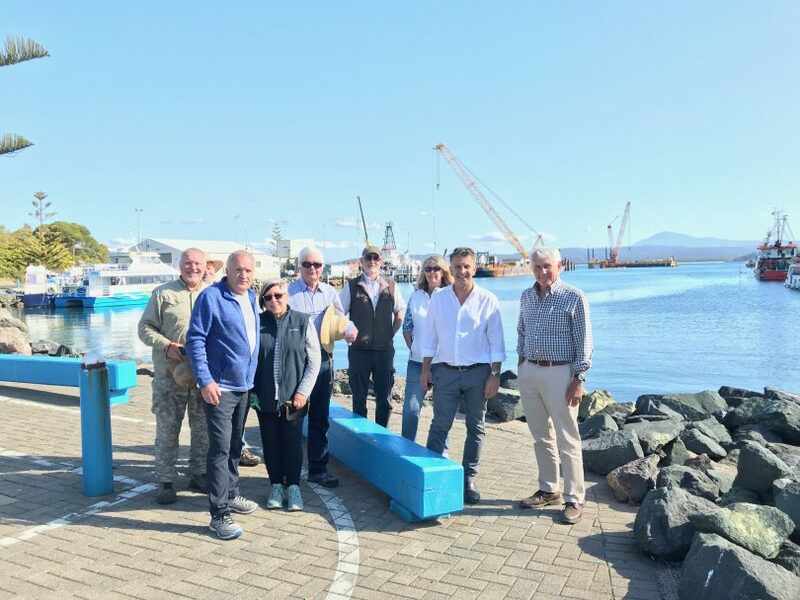 “The Snug Cove Harbour will be a major attraction for anyone planning fishing, sailing or just coastal cruising during their holiday, in retirement or just as part of their day in this great place to live,” Mr Bain says. The proposed location of the 366m wave attenuator. Photo: NSW Dept of Industry. Now that funding for the attenuator has been secured, POEM’s next priority is investment in the 170 berth commercial marina which will sit to the north of the shelter. The land and waters earmarked are owned by the Crown and Mr Bain is hopeful the NSW Government will kick-start the vision now that the style of attenuator needed has been decided. “There are a number of different funding models the government could use, what they have done at Bermagui and Batemans Bay already are good examples,” he says. This is great news for Eden and Snug Cove, I would like to thank all the people behind POEM like Dr Rob Bain and Glenn Brunette and many others for their dedication to bringing this project to fruition and together with the Cruise Ship Port extension project already started the future looks bright for this little township.